Nancy Reagan passed on Sunday and amidst the tributes to a former First Lady, there's the sad sense that there really is not much to celebrate from her years in the White House. Her purpose, like that of most first spouses, was to ensure her husband’s legacy and interactions were respected and went smoothly. She had amazing outfits but did not capture the public like a Jackie Onassis Kennedy, and definitely didn’t have the policy and intellectual mandate of a Hilary or Michelle. (And she certainly was no Mellie, my new prototype for Republican First Ladies.) That is not to say Nancy was not a full fledged human who deftly managed politics. She definitely did that, apparently getting a Secretary of the Treasury fired and also partaking in the tea summit as the nation left the Cold War era. Letting her personality take a backseat to her husband's was likely part of a larger plan. 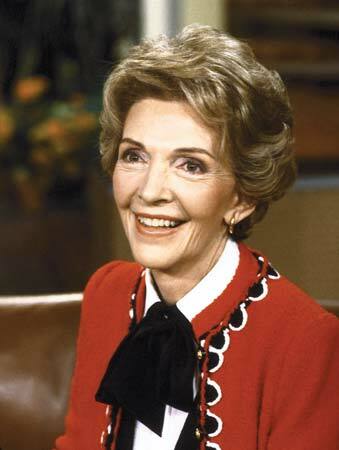 Nancy did seem to do a lot for causes after the Reagan years, notably working with Alzheimers groups. But her term time legacy will be that of “Just Say No,” and her participation in a war on drugs, the larger purpose of which is still contested. The manufactured images of crack babies and welfare queens that dominated media in the Reagan-Bush era still have repercussions today. That why there’s a petition happening right now to get Trap Queen played at her funeral. Nancy did leave us with something to be honored though. And that is the sitcom cameo. Certainly, Mrs. Reagan wasn’t the first person to take to prime time for a very special episode, but her appearance on A Different Strokes is one that will forever be touted as a prime example of politics and pop culture combining for a serious message. So if you've been searching for a reason to honor Nancy Reagan in her passing this week, let's all remember that you can "just say no," but more importantly remember that all the little experimenting drug users are not the Arnolds and Dudleys of the world.